Rhodos is the largest of the Dodecanese isles and the fourth biggest in Greece. Covers an area of 1.398 square meters and a population of 112.447 of which 60.000 residents live in the city of Rhodos and the rest in the 44 villages and small towns scattered around the island. At nearly 260 nautical miles away from the port of Piraeus has daily ferryboat connections with the mainland Greece. There are many flights every day to Athens, Thessaloniki, Heraklion in Crete and also connections with some of the smaller neighboring islands. During the holiday season (typically April to October) there are a high number of charter flights and direct connections with the important European cities. The terrain is mainly mountainous, the highest mountain is Ataviros at almost the center of the island. Olive trees, vines and other fruit producing trees are cultivated all over the island. 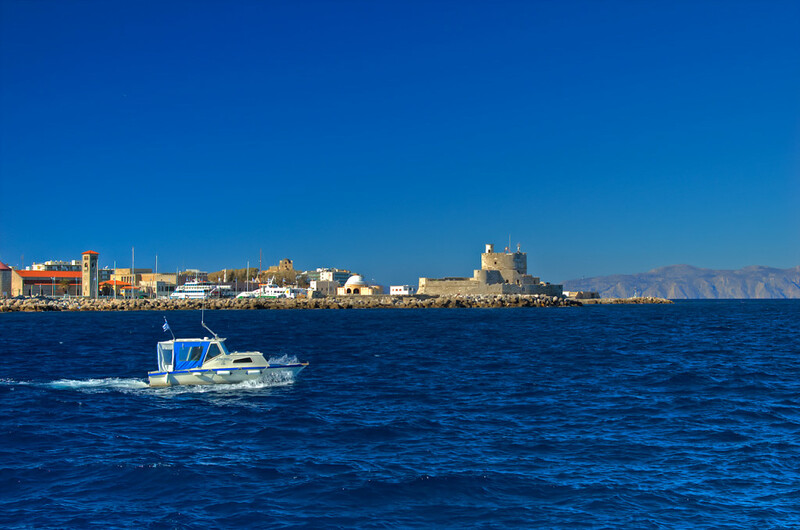 Rhodes is graced with an exceptional mediterranean climate, mild winters and sunny cool summers thanks to its sea breeze and the west winds (meltemi). The island has sunshine during most of the year. As it is said: “There is hardly a day without sun”. The sunlight makes the island’s wine exquisite and gives the ibiscus (flower-symbol of Rhodos) their special, vivid red color. Rhodos is an extremely popular destination that appeals to people of all ages. Families, couples and groups of singles all enjoy the island for relaxation, the range of activities available and the nightlife. The combination of sun, beautiful nature, clean sea waters, exceptional archaeological and historical monuments, modern tourist infrastructures and relaxed life style are some the reasons that made Rhodes one of the most renown vacation spots in the world attracting thousands of holidaymakers year after year. Rhodos has brilliant beaches, some of the best in the Mediterranean (Tsambika beach), covered in golden sands leading down to the waters edge. Many of them are organized with plenty of sunbeds and parasols available to hire and offer a number of water sports (banana boat rides, jet-skiing, water-skiing, windsurfing, surfing, snorkeling, scuba diving, parasailing, paragliding). The island is one of the top locations in the world for kite and wind surfing. However if you are just looking for a place to relax then you will find a number of quiet beaches, most of them in the southern part, that you can enjoy. The town of Rhodos is located at the most northern point of the island. Mandraki is the town’s old seaport, now mainly used as marina. In its entrance, you can admire the two sculpted deers that stand out and opposite there are the old picturesque windmills and Saint Nikolaos’s firehouse. It is believed that this is the place that once stood the famous Colossus of Rhodos. The town has great shopping, restaurants and nightlife, people from all over the world pay the island a visit during the summer, so it has a truly international feel, visitors can find Zara, Marks & Spencers, BHS, McDonalds, Pizza Hut and of course all the great clothing brands from Versace to Billabong. The commercial center is mainly located around Cyprus Square, where numerous stores, offices, banks, restaurants, cafes and bars are concentrated. The center has fine pedestrian streets, a lot of parks and old buildings to admire, coming from various periods. the Mourat Reis monument and its minaret. Lies next to the Casino and it is a stub of the Ottoman mastership. The Rhodos Aquarium a built during the Italian occupation, one of the oldest aquariums in the mediterranean still visited by thousands of tourists every year, situated in the most north point of the city. Just 1,5 km from the town center on the hill of Saint Stephanos (or Monte Smith) overlooking the town and the bay of Ixia, lies a marvelous archeological site, the Acropolis of Rhodes with the temple of Apollo and its ancient Stadium. At the top, walkers go by and enjoy the superb sunset blended with the panoramic view of the bay and the city below.